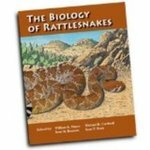 "The Biology of Rattlesnakes Symposium" by William K. Hayes, Kent R. Beaman et al. James Biardi is a contributing author, "The ecological and evolutionary context of mammalian resistance to pitviper venoms", pp. 557-568. Book description: Eliciting so many emotions of persons coming into contact with rattlesnakes, including fascination, curiosity, awe, and fear, this book showcases the finest research to date by investigators encompassing an enormous breadth of expertise. With 50 original contributions from 98 authorities covering a diverse range of topics, this landmark volume will be looked upon as authoritative for years to come. Provides an update on the history of the study of rattlesnakes, morphological and physiological adaptation and variation, behavior and natural history, properties of their venom, and perhaps most importantly, what should and must be done for the conservation of these wonderful creatures. Hayes, William K.; Beaman, Kent R.; Cardwell, Michael D.; Bush, Sean P.; and Biardi, James E., "The Biology of Rattlesnakes Symposium" (2008). Biology Faculty Book Gallery. 4.